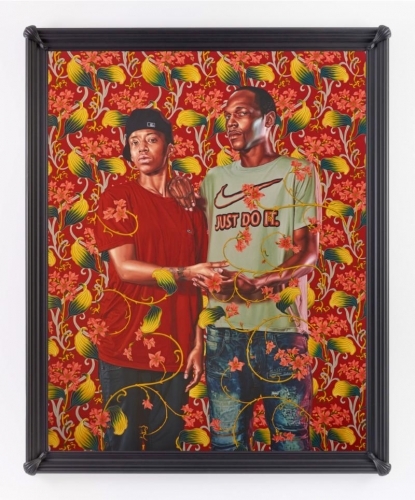 Kehinde Wiley creates large-scale oil paintings of contemporary African American subjects in poses that recall grand traditions of European and American portraiture. His models—real people dressed in their own clothing—assume poses adapted from historic paintings. Wiley’s portraits often feature ornate and decorative backgrounds, elements of which surround and sometimes weave around his subjects. His works address the politics of race and power in art, drawing attention to the pervasive lack of representation of people of color in the art world. The Saint Louis Art Museum is proud to present Kehinde Wiley: Saint Louis, an exhibition that is deeply connected to this city and informed by visits Wiley made in 2017. Through a process of street casting, he invited strangers he met in neighborhoods in north St. Louis and Ferguson to pose for his paintings. Wiley then created eleven original portraits that are inspired by carefully chosen artworks in the Museum’s collection. In 2018 Wiley became the first African-American artist to paint an official U.S. Presidential portrait for the Smithsonian National Portrait Gallery. Former U.S. President Barack Obama selected Wiley for this honor. Wiley has held solo exhibitions at the Brooklyn Museum, the Jewish Museum in New York, the Columbus Museum of Art, and the Studio Museum in Harlem. His works are included in the collections of numerous public institutions. Kehinde Wiley: Saint Louis is curated by Simon Kelly, curator of modern and contemporary art, and Hannah Klemm, assistant curator of modern and contemporary art with Molly Moog, research assistant. This exhibition and related programs are supported with a grant from the Trio Foundation of St. Louis. Additional support is provided by Mary Ann and Andy Srenco.